Schilling Cider & Bad Rider Reviews: two great tastes that taste great together. One of these days I’m going to write a whole review from Schilling’s Cider House, because they get a fair amount of stuff on tap that you can’t buy bottled or in a growler, but today I just wanted to pick up a couple things to review (and a bottle of Honey Bear because I had a craving), so here we are with today’s subject: Schilling’s Berry Cider. It’s a mild 5.5% ABV and a clear ruby in color — not a dark ruby like red wine, more like a rosé. It smells kind of like breakfast: a slice of buttered toast slathered with raspberry jam in your hand, a glass of apple juice beyond, on the table waiting for you to take a sip. As you might expect from any cider with berry fruit, the taste is sour, tart, sharp with acid but also sweet. It’s a fruity, cheerful, summertime sort of flavor to me, and it gives an edge of eager enjoyment to days like today, when the sun is bright and the sky is clear and it’s not quite summer yet but you can tell we’ve turned the corner. 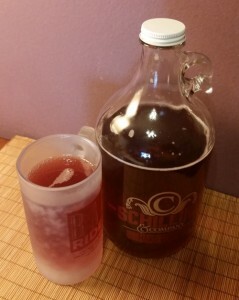 This entry was posted in Cider and tagged berry cider, draft, schilling cider. Bookmark the permalink.